Analysing RF power in both time and statistical domains. They perform RF peak power measurements, RF average power measurements of signals up to 40 GHz and RF Voltage measurements. Applications include pulsed RF signals such as RADAR, repetitive pulsed signals such are MRI, and pseudorandom or noise-like signals such as CDMA, WLAN, WiMAX, WCDMA/ UMTS and LTE. The 4540 Series RF power and voltage meters are suitable for virtually all kind of RF signals. Boonton offers a large variety of high-dynamic peak and average power sensors, as well as voltage probes for the 4540 Series. 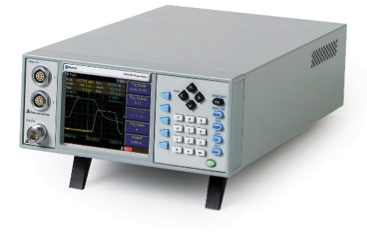 This advanced instrument provides average, modulated signal, pulsed signal and statistical operating modes making it well suited for R&D, manufacturing, control and maintenance operations. The Power meter is available as single channel version (4541) and dual channel version (4542). Boonton’s 4540 Series RF Power Meter offers a very detailed representation of measured signals, allowing thorough RF signal analysis. A time resolution of 200 picoseconds, unprecedented in a power meter of this class, and sophisticated Random Interleaved Sampling (RIS) technique, together with optimized sensor characteristics allows for this very high signal definition. RIS delivers an effective sampling rate of up to 5 GSamples/second. Furthermore, 4540’s state-of-the-art hardware and special algorithm provide an ultra-fast screen repetition rate.